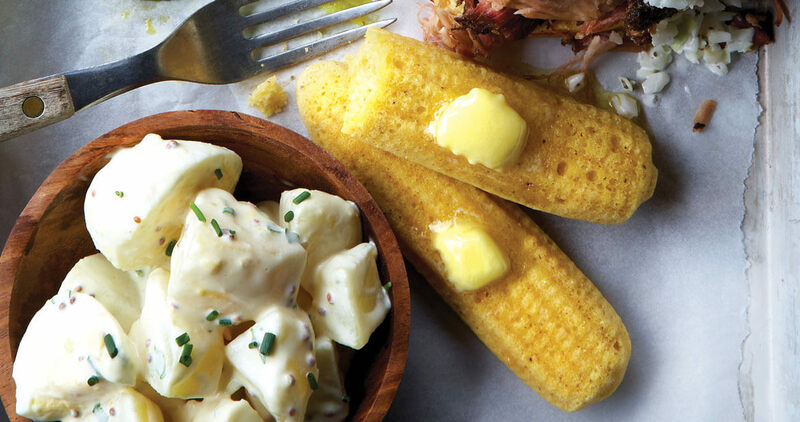 A cast-iron corn-stick pan will give soft, moist cornbread a crunchy, crispy exterior. Note: This recipe calls for cast-iron corn-stick pans, but a 10-inch cast-iron skillet will work, too. Bake at the same temperature for 20 to 25 minutes. Heat oven to 425°. Place corn-stick pans in preheated oven for 15 minutes. Meanwhile, combine cornmeal, flour, salt, and baking powder in a mixing bowl. In a separate bowl, combine eggs, buttermilk, and 3 tablespoons of bacon grease. Add egg mixture to the dry ingredients and stir until just combined. Remove corn-stick pans from oven and carefully brush each mold with bacon grease. Spoon batter into each mold, about ¾ full, and bake for 20 minutes or until edges are crispy and tops of corn sticks are golden brown.